Thanks for the well wishes you guys! Having a cold is no fun, but I hope to kick it soon. The above photo is awesome for many reasons. 1. 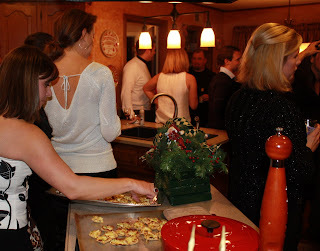 Jeannie, my bff & the hostess, is pictured placing Blue Crab Nachos onto a serving dish. Holy moly those little nachos are the best appetizer on the planet. If you want the recipe, just click on the words Blue.Crab.Nachos above. You WILL thank me! 2. Cousin Eddie from Christmas Vacation is in the photo. You can see him in the white sweater with the black dickie. Look closely. Gary and I were laughing so hard at him. He was even wearing white shoes. I love that he wore the Eddie get-up. Hysterical. And brave. I wonder what people that HAVEN'T seen Christmas Vacation thought. First of all too bad for them....CV is only the BEST CHRISTMAS MOVIE EVER!!! I bet they thought his sense of style were lacking. I mean white shoes in winter. Gary and I thought it was priceless and even wished we had thought of it ourselves. Another party guy showed up in his mother-in-laws old Christmas sweater. It was complete with the moth ball smell. Next year I am so planning on hosting an 'Ugly Christmas Sweater' party. So, if you can get your husbands to do it, Eddie at the Christmas party this year would be AWESOME!!! Gary and I had so much fun having an adult night out on Saturday night! Thank you Susan for hanging out with the kiddos. We appreciate it more than you know. I am definitely clicking on that recipe! Ohmygoodness! I would have loved to have seen the cousin Eddie outfit! How funny! I wonder if I could talk my hubby into doing that...probably not! I forgot to say I love the new header!! So cute! Your blog is looking very festive!! Every man should wear a dickie and wear it proudly! I love the new bloggy look! Adults night out is always great! Oh how GREAT! I had to do a double take at the lighted picture of the house on your blog...I thought Wow, is that her house...then, I realized it was CV! haha! Love it! What a fun party! HAHA!! So funny...love it! Our Bunco group did the ugly Christmas sweater theme last Friday night, and I missed it to take my girls to the Christmas parade. And, I have had my ugly Christmas sweater ready to go since October when my granny sent it for my garage sale! also...love the new header!! Too cute!! Don't you just love when a picture captures so many great things. I think I will make those nachos for our New Years party. So fun! And your kids are just precious! Glad I stumbled over! What a fun time!! I need to get that recipe, sounds so good!